This site is designed to explain a little bit about the process I went through to solve the challenge of creating a Hangman app. I hope you enjoy the process and appreciate the love I put into this. The idea behind my Hangman app was to enhance the social aspect of the challenge with three types of games: single, challenge and multiplayer. The SINGLE type allows the user to play alone and earn points. The CHALLENGE type is a daily challenge and the user can only play 1 game per day. The idea is to invite back the users to play at least one time per day. They earn points as well. Finally, we have the one that will be the most fun, the MULTIPLAYER type. This allows the user to create a private game and invite up to 3 friends. They can compete on a 5, 10 or 15 word game and see who gets more points. Each type of game has its own Leaderboard. I put a special emphasis on the design of the app and the ability of the user to make custom decisions from the Settings menu. The app was made in Swift and Firebase was used for the back end. To access the Hangman Challenge code please click in the GitHub icon. Detailed description of what happened from day one to submission day. Challenge received. Initial excitement and getting ready to start working on the app. Setup GitHub and local files. Downloaded 15 hangman games from the App Store for testing and ideas development. Started working on the data structure. Decided to go with Firebase as the backend engine for user and data. Setup Firebase and initial views of the challenge. Created the Main and Game views. Finished data models, views and algorithms of the single and challenge game. Created the data models, views and algorithms for Leaderboards. Linked them to the backend. 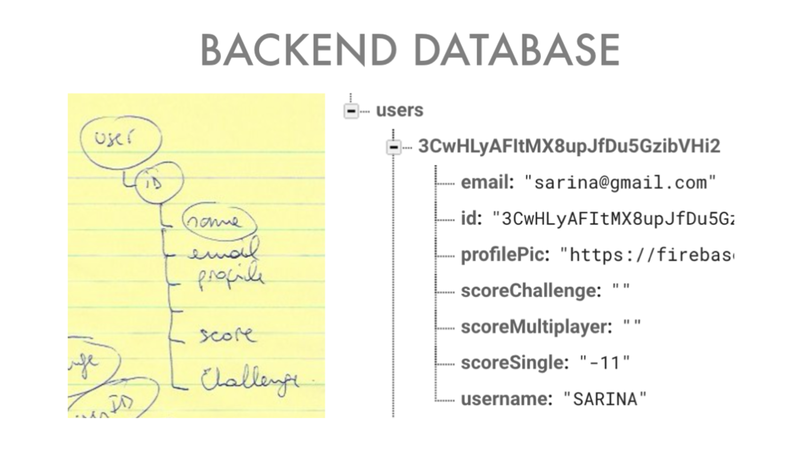 Setup data model, algorithms, views and backend interaction for the multiplayer games. At this point the game stopped working. After a moment of panic where I thought I had to kill the multiplayer game, I redid the entire data model, algorithms and interaction with Firebase. The app started working again! Spent half day fixing bugs, design and tweaking some parts of the code. The other half I spent adding all the constraints so it can be played in iPhone SE, iPhone 6 & 7 and iPhone 6+ & 7+. Final rounds of testing and creation of the website to present the challenge. This was definitely fun and I'm proud of the final result. I did a lot of sketches on a notepad, don't laugh, I like notepads, especially the old yellow ones. After I finished the challenge, I went back to the notes and realized the contrast between my sketches and the final product. The result is interesting so I thought it would be worth sharing. Here are all the notes and sketches for the challenge. Some of them have designs, some sketch the UI and there are a lot of data structure notes. I had a lot of fun building this app! I can't wait to meet the team!